Part II of our World Theatre Festival interviews series brings us into conversation with ANDY FREER of Snuff Puppets. OFFSTREET: Describe your show in under 25 words. ANDY FREER: Wedhus Gembel explores the tensions between traditional and contemporary Indonesian life. It is a parable about the cycle of life and duality; from destruction there is creation, from chaos there is harmony. OS: What stands out for you about the festival’s aims and programming in 2014? AF: WTF’s commitment to presenting irreverent, cross-cultural, globally relevant programming matches Snuff Puppets’ company ethos to push boundaries and create entertaining, experimental and culturally diverse performances that challenge the possibilities of theatre today. OS: Wedhus Gembel is an Australian-Indonesian collaboration. What have cast members learned from one another during this extended collaboration, especially in travelling to India and Peru? AF: Collaboration is key to this work; it was how it was created and it is how it continues to run and be presented. Wherever we tour the show we run a free two-day performance-making workshop with people from the local community. The work created over those days is then presented within the show. Sharing and learning from each other within new groups of people and cultures gives everyone an amazingly diverse place to learn and discover. Having toured throughout Java, Indonesia and been presented in Melbourne, Australia and Lima, Peru, the cultural diversity of these places has impacted this collaboration, creating an endlessly rich and fascinating learning experience for everyone involved. Wedhus Gembel is essentially a visual spectacle that transcends language barriers and covers universal themes. 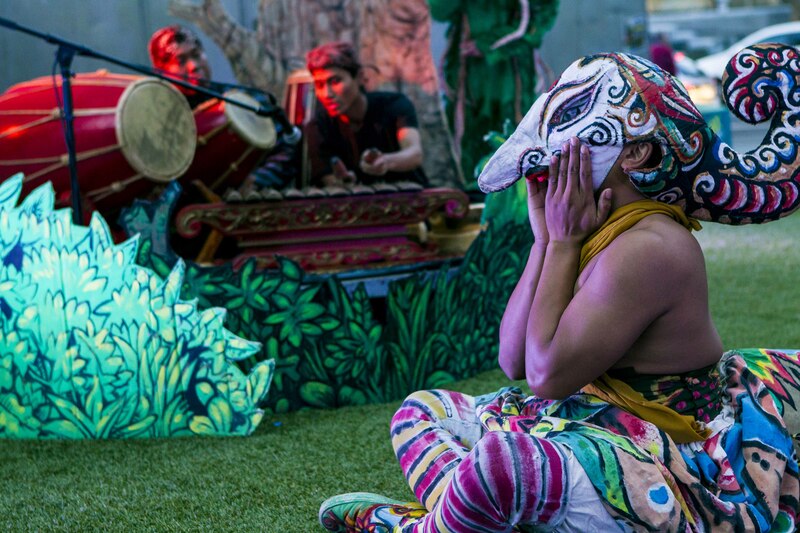 The form lends itself to being a cross-fertilisation of cultures primarily because of the Australian/Indonesian collaboration, but also because it includes a performance-making workshop in whatever country we are presenting. Inherently we absorb the culture, living and performing with the people of these new places. OS: What are the challenges and benefits of telling a story with puppets of such epic proportions? AF: The challenges technically are often transporting and storing our giant puppets. Interestingly, the solving of this problem became a benefit. We were able to pack the whole show into our luggage quota; now a five-metre mountain-volcano plus all the puppets and props travel with us in our luggage. The scale of our puppets, all being bigger than an average human, give a sense for the audience of being in a transgressive space. It is in this place that audiences are disarmed and perspectives shifted. The puppets play in the realm of mythology and dreams, creating a joyously chaotic and transformative outdoor spectacle of epic proportions. OS: What will Wedhus Gembel leave its audiences feeling? AF: Our aim is to give our audiences an insight into an amazingly rich and exotic Javanese culture. They will be swept up in a story of love and nature, superstition, chaos, magic and mythology. There is also some very cool music and we invite the audience onto and into the performance . . . it must be seen to be believed. WEDHUS GEMBEL runs from Feb 18 to 22 for World Theatre Festival.